I don’t know about the rest of you, but lately my poultry purchases at my local market have become more and more of a ‘hit-and-miss’ situation, with more ‘misses’ if I’m being honest. As I bite into my homemade chicken nuggets or Coq au Vin (when I’m feeling fancy) I can’t help but feel that the chicken just tastes weird, stringy, just…funny. So a few days ago when I turned on the tube and saw the news headlines stating that the FDA has finally confirmed that chicken meat sold in the USA contains arsenic, my head, and stomach, nearly hit the roof. 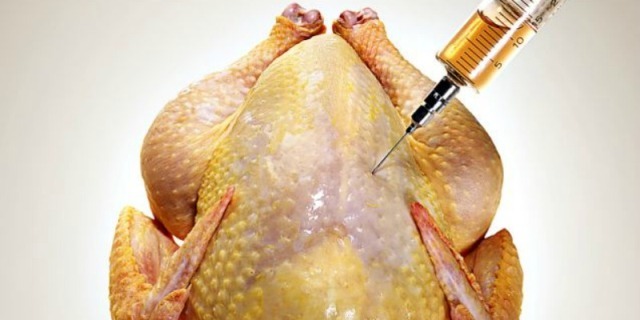 This cancer-causing toxic chemical, that in high doses could kill you, is actually being added to chicken feed on purpose, giving store-bought chicken the illusion of healthy coloring and plump appearance. Shockingly, this is the case with more than 70 percent of all U.S. chickens! That is just awful! But now the evidence is so undeniable that the manufacturer of the chicken feed product known as Roxarsone has decided to pull the product off the shelves . And what’s the name of this manufacturer that has been putting arsenic in the chicken feed for all these years? Pfizer, of course — the very same company that makes vaccines containing chemical adjuvants that are injected into children. What’s astonishing about all this is that the FDA tells consumers it’s safe to eat cancer-causing arsenic but it’sdangerous to drink elderberry juice! The FDA recently conducted an armed raid in an elderberry juice manufacturer, accusing it of the “crime” of selling “unapproved drugs.” Which drugs would those be? The elderberry juice, explains the FDA. You see, the elderberry juice magically becomes a “drug” if you tell people how it can help support good health. Oh, by the way, here’s another sweet little disturbing fact you probably didn’t know about hamburgers and conventional beef: Chicken litter containing arsenic is fed to cows in factory beef operations. So the arsenic that’s pooped out by the chickens gets consumed and concentrated in the tissues of cows, which is then ground into hamburger to be consumed by the clueless masses who don’t even know they’re eating second-hand chicken sh*t.